Home / For Patients / ALL, ALC, and LET what is it all about? ALL, ALC, and LET what is it all about? These pages give an overview of information concerning specific aspects of surgery to control rotation and giving way of the knee as additional to Anterior Cruciate ligament reconstruction. This address the AnteroLateral Ligament, the AnteroLateral Capsule and Lateral Extrarticular Tenodesis. At the end there is a section for medical professionals along with references for further reading. ACL, ALL, ALC: What does it mean? The Anterior Cruciate Ligament (ACL) is an intra-articular (inside the knee joint) ligament which has two main functions: to prevent the tibia from sliding out in front of the femur (translational control), and to provide rotational stability (rotational control) of the knee. Other extra-articular (outside the knee joint) structures, especially on the lateral (outer side of the knee joint) side of the knee, also provide rotational control to the knee. One of these extra-articular structures is the AnteroLateral Ligament (ALL), which was actually first described in 1879, and recently rediscovered and widely documented 4. This ligament runs along the lateral outer aspect of the knee, between the femur and the tibia. The ALL tightens when the knee is internally rotated (twisted inwards) and in doing so provides rotational stability of the knee 18. The ALL belongs to a larger complex of the knee, the AnteroLateral Complex (ALC), which is located on the anterior (front) and lateral part of the knee at the same level as the knee joint. This complex, mainly the ALL, the joint capsule components and the Kalpan’s fibers (between the femur and the Ilio-tibial band), also contributes to controlling the rotational stability of the knee 9,14 (Figure 1). Consequently, during a rotational injury of the knee, the ALC is frequently injured. A capsular bony avulsion (pull off) of the ALC, also called a “Segond fracture”, is virtually always associated with an ACL tear 3. This lesion has been shown to be present in some acute ACL injuries, and is associated with significantly increased rotational knee instability. Figure 1. Knee lateral view showing the anterolateral complex including: ALL, the joint capsule components and the Kalpan fibers. 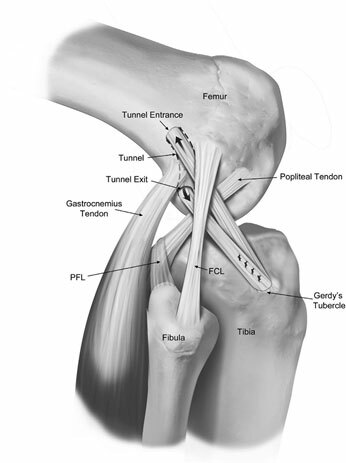 (ALL, anterolateral ligament; FCL, fibular collateral ligament; GT, lateral gastrocnemius tendon; ITB, iliotibial band; LE, lateral epicondyle; PLT, popliteus tendon) Reprinted with permission from Dr Rob LaPrade (Godin et al. 10). Why add an additional procedure to an ACL reconstruction? When knee instability due to an ACL injury is diagnosed, an ACL reconstruction is recommended to replace the torn ligament using graft tissue. However, despite many years or research and progress a proportion of patients either reinjure their knee or do not get back full knee function. The optimal ACL reconstruction is still a highly debated clinical issue in orthopaedic research. Some studies highlight that a simple ACL reconstruction can control the translational instability, but is not able to functionally restore completely normal knee rotational stability. Despite a technically successful operation, some patients may continue to have a degree of rotational instability, known as Anterolateral Rotational Instability (ALRI). This persistent instability is what may lead to the unsatisfactory results, especially for high level athletes not being able to resume their previous level of sports performance. In addition, the ALRI can also be a cause of graft failure. There is growing evidence that adding a procedure to tighten and help stabilise the outer aspect of the knee reduces the risk of re-rupture, particularly in these higher level athletes. Reinjury after ACL reconstruction is a significant issue, especially in younger and higher level athletes, and this has prompted surgeons to look for additional procedures to improve stability. Therefore, the concept of combining a lateral extra-articular procedure with an intra-articular reconstruction for the treatment of ACL injury emerged, with the objective of addressing potential ALRI of the knee and decreasing the failure rate after an ACL reconstruction carried out in isolation 8. Currently, two types of additional anterolateral procedures are commonly used: The Lateral Extra-articular Tenodesis (LET), and the ALL reconstruction. LET, ALL reconstruction: What does it mean? Both these two procedures may be performed in combination with ACL reconstruction. The first type of anterolateral extra-articular procedure developed was the Lateral Extra-articular Tenodesis (LET). This procedure concentrated on stabilising knee rotational instability using the ilio-tibial band (ITB) to reinforce the ALC. Whatever the technique used, an LET usually involves fixing a part of the ITB to the femur just above the knee joint. Methods of performing an ITB lateral tenodesis were described initially by Lemaire in 1967 (Figure 2), MacIntosh in 1972, and Ellison in 1979 as a novel way of controlling ALRI. Despite some improvements of the original techniques, these eponymous terms are still used today 7,16. With the renewed interest for the ALC, some surgeons developed new procedures to reconstruct the ALC and especially the ALL: the ALL reconstruction 2,11,19 (Figure 3). The aims of this procedures are similar to the LET, but it attempts to reconstruct a native ligament to be more physiological and anatomical, similar to the native ALL. In short, an ALL reconstruction involves fixing a free graft (commonly a hamstring tendon) between the tibia and the femur in the same location as the native ALL. Figure 2. Lemaire surgical technique. (FCL, fibular collateral ligament; PFL, popliteofibular ligament.) Reprinted with permission from Dr Rob LaPrade (Slette et al. 16). Figure 3. ALL reconstruction techniques with one (3a)2 or two bundle (3b) 19. (ALL, anterolateral ligament; FCL, fibular collateral ligament; GT, lateral gastrocnemius tendon; ITB, iliotibial band; LE, lateral epicondyle; PLT, popliteus tendon. Reprinted with permission from Dr Rob LaPrade (Dephillipo et al. 6). When to perform an LET or ALL reconstruction? To answer this question, it is important to differentiate between a primary ACL reconstruction surgery and a revision ACL reconstruction surgery. Primary surgery is intended to stabilise the knee after an ACL injury. A revision surgery is a procedure performed on the same knee when the first surgery has failed (rupture of the ACL graft). In a primary surgery incorporating ALL or LET, the objectives are to: 1) have better control of the ALRI and 2) decrease the risk of re-injury. Although the criteria are not clearly defined, this additional procedure can be recommended in primary surgery for patients with a high risk of re-rupture, such as those with high grade rotational instability, pivoting sports in high level competitive athletes, hyper-laxity, Segond fracture, or patients undergoing delayed reconstruction 7,17. In revision surgery, the addition of an extra-articular procedure is commonly considered in the setting of a revision ACL reconstruction 20. By tightening and further stabilising the outer aspect of the knee, this additional surgery is frequently used with the intention of reducing the risk of re-injury. What are the changes in the rehabilitation? Compared to isolated ACL reconstruction, the postoperative discharge instructions after an LET or an ALL reconstruction are essentially the same. The only difference is that there will be one additional wound on the lateral side of the knee. Following combined ACL reconstruction and anterolateral procedure, a rehabilitation program is started immediately to help gradually restore mobility and resume usual daily activities. Recommendations for return to sport vary between surgeons, but is usually planned for approximately 9 months postoperatively, to allow the grafts to properly heal and to enable restoration of sufficient strength and balance to protect from reinjury. In order to avoid re-rupture, ACL injury prevention programs have been developed. After a combined surgery, these programs are also advocated (cf link below). Despite some anatomic inconsistencies, a majority of authors agree that the ALL femoral insertion is posterior and proximal to the lateral epicondyle, and its tibial insertion is approximately at the midpoint of the line connecting Gerdy’s tubercle and the fibula head 4,5,15. While its contributions to tibial anterior translation control and a high grade Pivot-Shift test are still unclear, there is a consensus that the ALL is involved in control of tibial internal rotation 1,14,18. Even with anatomic, histologic and biomechanical evidence for the existence of the ALL, several controversies exist. Whether this structure is a ligament or a capsular thickening, the importance of the ALC in ALRI is undoubted. Therefore, orthopaedic surgeons face two important challenges. The first challenge is to identify a combined ACL and ALC injury in order to define clear indication criteria for a combined procedure. The second is to determine the benefits of adding an ALL reconstruction to an ACL reconstruction, and to compare the ALL reconstruction with LET to help surgeons choose the most appropriate technique for each patient. Surgeons have long recognised that LET procedures offer a powerful tool to control rotation of the knee. There is strong evidence that LET is an effective procedure in terms of decreasing the rotational laxity. The literature also reveals that the addition of LET to an ACL reconstruction does not provide clear additional benefit in controlling rotation in early primary reconstructions (≤12 months), but is effective in reducing the postoperative ALRI in a delayed reconstruction 7. This procedure is likely to benefit patients undergoing delayed reconstruction with significant rotational instability, or in the case of revision surgery. However, some studies have demonstrated that this procedure can over-constrain the lateral tibiofemoral compartment with a risk of postoperative stiffness 8,12,13. As much as the benefit of LET for revision surgery is amply proven, its use in primary surgery remains somewhat controversial, and the indications are still therefore being defined 7. Chahla J, Menge TJ, Mitchell JJ, Dean CS, LaPrade RF. 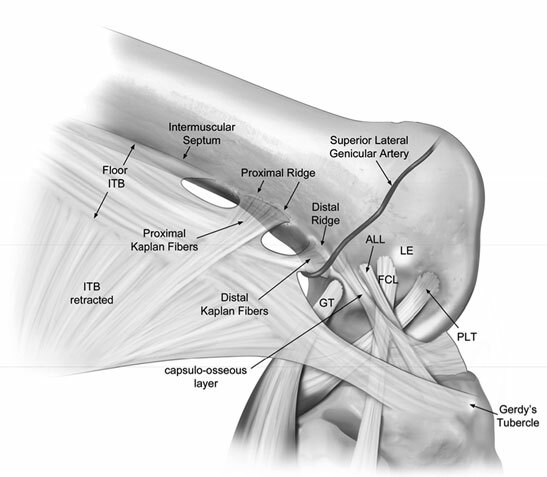 Anterolateral Ligament Reconstruction Technique: An Anatomic-Based Approach. Arthrosc Tech. 2016;5(3):e453-457. doi:10.1016/j.eats.2016.01.032. Claes S, Luyckx T, Vereecke E, Bellemans J. The Segond fracture: a bony injury of the anterolateral ligament of the knee. Arthrosc J Arthrosc Relat Surg Off Publ Arthrosc Assoc N Am Int Arthrosc Assoc. 2014;30(11):1475-1482. doi:10.1016/j.arthro.2014.05.039. Claes S, Vereecke E, Maes M, Victor J, Verdonk P, Bellemans J. Anatomy of the anterolateral ligament of the knee. J Anat. 2013;223(4):321-328. doi:10.1111/joa.12087. Daggett M, Ockuly AC, Cullen M, et al. 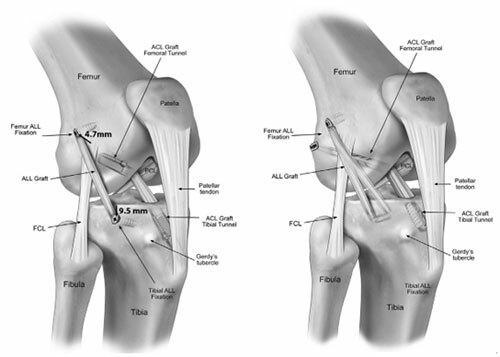 Femoral Origin of the Anterolateral Ligament: An Anatomic Analysis. Arthrosc J Arthrosc Relat Surg Off Publ Arthrosc Assoc N Am Int Arthrosc Assoc. 2016;32(5):835-841. doi:10.1016/j.arthro.2015.10.006. DePhillipo NN, Cinque ME, Chahla J, Geeslin AG, LaPrade RF. Anterolateral Ligament Reconstruction Techniques, Biomechanics, and Clinical Outcomes: A Systematic Review. Arthrosc J Arthrosc Relat Surg Off Publ Arthrosc Assoc N Am Int Arthrosc Assoc. May 2017. doi:10.1016/j.arthro.2017.03.009. Devitt BM, Bell SW, Ardern CL, et al. The Role of Lateral Extra-articular Tenodesis in Primary Anterior Cruciate Ligament Reconstruction: A Systematic Review With Meta-analysis and Best-Evidence Synthesis. Orthop J Sports Med. 2017;5(10):2325967117731767. doi:10.1177/2325967117731767. Geeslin AG, Moatshe G, Chahla J, et al. Anterolateral Knee Extra-articular Stabilizers: A Robotic Study Comparing Anterolateral Ligament Reconstruction and Modified Lemaire Lateral Extra-articular Tenodesis. Am J Sports Med. 2018;46(3):607-616. doi:10.1177/0363546517745268. Getgood A, Brown C, Lording T, et al. The anterolateral complex of the knee: results from the International ALC Consensus Group Meeting. Knee Surg Sports Traumatol Arthrosc Off J ESSKA. July 2018. doi:10.1007/s00167-018-5072-6. Godin JA, Chahla J, Moatshe G, et al. A Comprehensive Reanalysis of the Distal Iliotibial Band: Quantitative Anatomy, Radiographic Markers, and Biomechanical Properties. Am J Sports Med. 2017;45(11):2595-2603. doi:10.1177/0363546517707961. Helito CP, Bonadio MB, Gobbi RG, et al. Combined Intra- and Extra-articular Reconstruction of the Anterior Cruciate Ligament: The Reconstruction of the Knee Anterolateral Ligament. Arthrosc Tech. 2015;4(3):e239-244. doi:10.1016/j.eats.2015.02.006. Inderhaug E, Stephen JM, El-Daou H, Williams A, Amis AA. The Effects of Anterolateral Tenodesis on Tibiofemoral Contact Pressures and Kinematics. Am J Sports Med. August 2017:363546517717260. doi:10.1177/0363546517717260. Inderhaug E, Stephen JM, Williams A, Amis AA. Biomechanical Comparison of Anterolateral Procedures Combined With Anterior Cruciate Ligament Reconstruction. Am J Sports Med. 2017;45(2):347-354. doi:10.1177/0363546516681555. Musahl V, Getgood A, Neyret P, et al. Contributions of the anterolateral complex and the anterolateral ligament to rotatory knee stability in the setting of ACL Injury: a roundtable discussion. Knee Surg Sports Traumatol Arthrosc Off J ESSKA. 2017;25(4):997-1008. doi:10.1007/s00167-017-4436-7. Neri T, Palpacuer F, Testa R, et al. The anterolateral ligament: Anatomic implications for its reconstruction. The Knee. August 2017. doi:10.1016/j.knee.2017.07.001. Slette EL, Mikula JD, Schon JM, et al. Biomechanical Results of Lateral Extra-articular Tenodesis Procedures of the Knee: A Systematic Review. Arthrosc J Arthrosc Relat Surg Off Publ Arthrosc Assoc N Am Int Arthrosc Assoc. 2016;32(12):2592-2611. doi:10.1016/j.arthro.2016.04.028. Sonnery-Cottet B, Daggett M, Fayard J-M, et al. Anterolateral Ligament Expert Group consensus paper on the management of internal rotation and instability of the anterior cruciate ligament - deficient knee. J Orthop Traumatol Off J Ital Soc Orthop Traumatol. February 2017. doi:10.1007/s10195-017-0449-8. Sonnery-Cottet B, Lutz C, Daggett M, et al. The Involvement of the Anterolateral Ligament in Rotational Control of the Knee. Am J Sports Med. 2016;44(5):1209-1214. doi:10.1177/0363546515625282. Sonnery-Cottet B, Thaunat M, Freychet B, Pupim BHB, Murphy CG, Claes S. Outcome of a Combined Anterior Cruciate Ligament and Anterolateral Ligament Reconstruction Technique With a Minimum 2-Year Follow-up. Am J Sports Med. 2015;43(7):1598-1605. doi:10.1177/0363546515571571. Vundelinckx B, Herman B, Getgood A, Litchfield R. Surgical Indications and Technique for Anterior Cruciate Ligament Reconstruction Combined with Lateral Extra-articular Tenodesis or Anterolateral Ligament Reconstruction. Clin Sports Med. 2017;36(1):135-153. doi:10.1016/j.csm.2016.08.009.